Take a much-deserved break from work, school, & your daily routine to explore Israel for 10 legendary days! 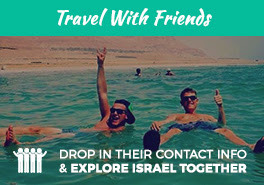 Spend your entire, authentic journey with old & new friends from your city & Israelis your own age. Gain local perspectives, challenge yourself through epic hikes, experience adventure, take in the captivating scenery, cities, flavors & culture of Israel, & so much more on this incredible experience. Now is the time for you to have the time of your life! Run in partnership with the Jewish federation of Greater Philadelphia, this Birthright Israel trip is the perfect option for young adults from or living in the Philadelphia community. "It's been less than 24 hours since our trip ended and I'm struggling to find the words to describe how important these people are and how meaningful this experience was."